Leading the American Gelbvieh Association as president for a second year is Rob Arnold of Minot, N.D. The other individuals who were elected to leadership positions on the AGA Executive Committee are Vice President Dan Warner, Beaver City, Neb. ; Secretary Duane Strider, Asheboro, N.C.; and Treasurer Neal Pearson, Lake City, S.D. During the annual election of the Board of Directors, three members were elected to their second term. These re-elected Board members are Bob Hart, Kansas City, Kan.; David Martin, Judsonia, Ark. ; and Grant Thayer, Ramah, Colo.
Two members were elected to their first term on the Board, including Emily Griffiths, Kendallville, Ind. ; and Walter Teeter, Mt. Ulla, N.C. The other individuals serving on the 2014 AGA Board of Directors are: Brian Dunn, St. John, Kan.; Andy LeDoux, Agenda, Kan.; Bob Prosser, Winslow, Ariz.; Ronnie Rogers, Mendon, Mo. ; Scott Starr, Stapleton, Neb. ; and Gary Tilghman, Glasgow, Ky.
Two members retired from their time on the Board. Ken Flikkema, Bozeman, Mont., and John Houston, New Carlisle, Ohio both completed two terms for a total of six years of service to the AGA. 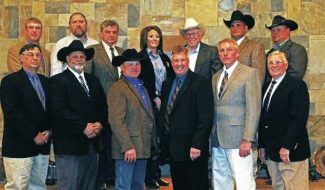 The election of Board of Directors and officers took place during the recent AGA Annual Convention held in early January. For more information about the American Gelbvieh Association, visit Gelbvieh.org or call 303-465-2333.